Simon & Sigalos hosted the Steve Brown Memorial Bike Ride to raise awareness for pedestrian and bicycle safety on our roadways. Over 200 participants and volunteers attended. Speeches were delivered by City Councilman Scott Singer and clergy from Temple Beth El of Boca Raton, where Steve Brown was a member. 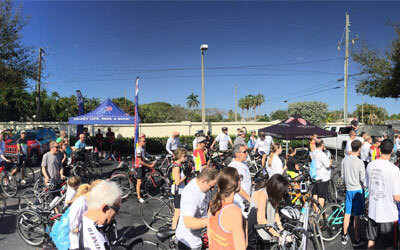 Michael Simon spoke on bicycle safety points before the riders embarked on a scenic ride along Ocean Boulevard in Boca Raton. Free bicycle helmets and lights were made available to all who attended thanks to generous sponsors and the Florida Department of Transportation Pedestrian and Bicycle Resource Center. Christine Nesheiwat, Brooke Simon and Michael Simon from the firm all helped with their volunteer efforts to make the event a great success.